I know I've been missing. I only wrote a handful of posts in 2017 and most of those were reviews I wrote for the Homeschool Review Crew. I mostly blamed my blogging silence on being too busy. But I think the real reason goes much much deeper. 2017 was a hard year for me. Harder than I want to admit. And it was busier. Yes I was very busy with homeschooling and doing the Crew but the busyness of 2017 was different. Harder. It's taken so much more out of me. I'd be lying if I didn't say that I was worried about 2018. The new level of normal busyness doesn't seem to be slowing down at all but I'm hoping I can learn to manage it better. 1) December of 2016 ~ very near the end of the month, my older brother passed away. I intend to blog about this sometime maybe. 2) Supergirl got very very very sick. She was diagnosed with Protein Losing Enteropathy or PLE a complication of being HLHS post Fontan. She also didn't want to walk anymore. This turned our world upside down. PLE crisis has resolved and she's stable. We've had 6 months of OT and PT. She has spiffy new green custom built for her wheelchair. 3) BooBear graduated from university. This most definitely needs a dedicated blog post if for no other reason for me to gush and post pictures. I am so proud of her! But the month of May was so busy with her finishing up! 4) Tailorbear graduated from high school! So busy trying to get things figured out for her to attend a local technical college and so in September she started a new job and a new school. The Taxi Driving keeps us all busy. 5) My Mama went into hospice and I went into denial. Mama passed away on October 16. I still don't think I'm ready to talk about it. Memory Eternal Mama I miss you so much. I do hope to post more regularly in 2018. 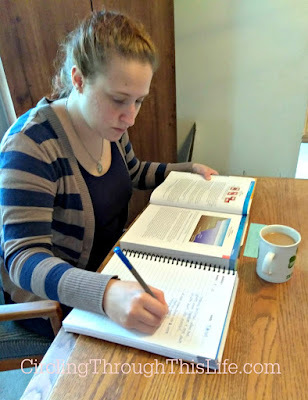 My blog might be less about homeschooling and more about random bits of my life but since I am still homeschooling Supergirl and still part of the Crew I am sure that I will still be talking about homeschooling. Five years ago I had the opportunity to review Everyday Cooking from Everyday Homemaking. This time, as a Crew Leader, I received an updated digital version of Everyday Cooking as well as a digital copy of Everyday Family Chore System. Like the Ninth Edition (revised in 2011), the new 12th Edition of Everyday Cooking,revised just this past July 2017, is full of recipes and tips. This new edition has 203 pages and more recipes! I know I said this 5 years ago but I must say it again. 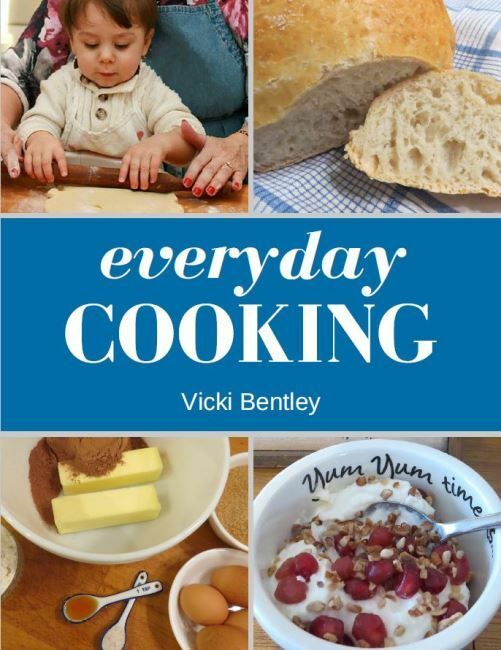 Vicki Bently cooks like me and I think that is one of the reasons I love this cookbook! When I think of old fashioned home cooking, I think of things like Mom's Roast, Chicken and Dumplings, or Hamburger Gravy. Yes, those are all recipes included in this book. When I think of everyday food or meals, I think of hamburger stroganoff, sloppy joes, and "unstuffed" chicken breasts. One of the new recipes is for an Asian Sweet and Sour Sauce. I also spotted new Skillet Chicken recipes and a Low-Carb Biscuit recipe. These are all on my to-try list. 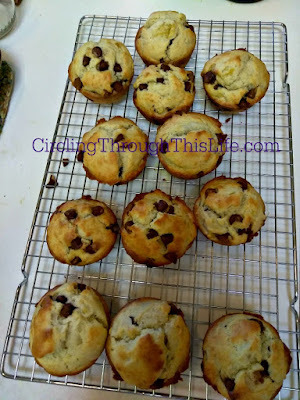 During the review period we adapted the Banana Muffin recipe to be Banana Chocolate Chip. When Boobear was lamenting that she hadn't had baked oatmeal in a long time I pulled out the Baked Oatmeal recipe. It was as good as we remembered. 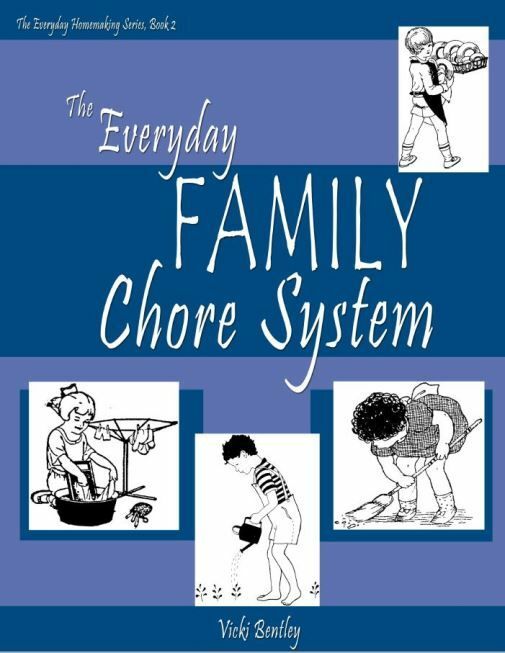 But what I really want to share with you is the Everyday Family Chore System. 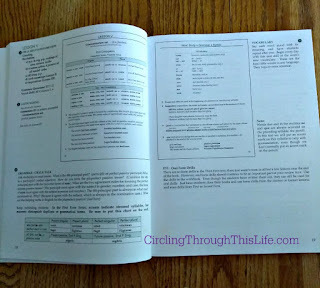 In 2012 when the Crew reviewed Everyday Homemaking last, I only had the opportunity to use the Everyday Cooking eBook. I needed to see the Everyday Family Chore System to perform my duties as a Crew Leader but I didn't think I would actually use it. I was wrong. My family is in a new season of life. 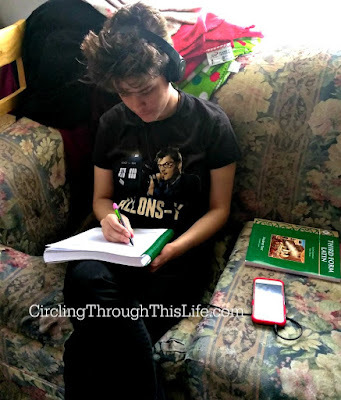 We started transitioning a year ago when Turtlegirl went away to college. Now we have to find another new normal for us as Boobear is an adult living at home. Tailorbear started classes at a local technical college. It will be just Supergirl and I home alone many days. We are all busy. We all live here. Chores still need to happen. We still need a system. We may not be in the season of chore training but just because the girls grew up doesn't mean the need to do chores has stopped. I don't know about your house but at my house I frequently hear the lament "I don't want to be the only one doing chores." Everyone feels like they are the only one who does it so they don't do it. That means nobody is doing chores. Things are just not getting done. This checklist should be a guideline and not a strict measuring stick. I love that she keeps it real by acknowledging that she is not competent in all the areas that she includes in the checklist. That made me feel better about the gaps I've noticed in my children (and myself!). Each of those sections are full of information! Even though much of this is focused on young children and teaching them how do the chores, I found reading this section to be what I needed to jumpstart my brain into thinking about possible systems. I keep coming back to the Delegate/assign Responsibilities section because I think this is the heart of what I need. There are 4 of us plus Supergirl. Even Supergirl is capable of doing some chores. Before we can divide up the chores (assign them! ), we need to know what it is we need to do be doing and deciding how often it needs to be done. She does have a list of possible jobs in Part 3. Like with the cookbook, I found myself nodding in agreement as I read through some of her tips and ideas in the Make it Easy to Succeed section in Part 2. I am glad I am not the only one who says "don't put it down, put it away!" I wonder if she is more successful with that in her family? I know several of my family members who really struggle with this concept. We once found math homework in the refrigerator. Still not quite sure how it ended up there but usually the object gets put down anywhere and we can't find it when we need it. This also means clutter and things laying out everywhere. Even as adults this is something we need to work on. The Implementing a Plan part of the book is the heart of the book. It is the longest section and it is filled with practical tips and ideas including suggestions for rewards. Before moving on to part 3 The Actual Chore System Mrs Bentley gives a quick review of parts 1 and 2. It is very tempting to jump right in with Part 3. I encourage you to read through parts 1 and 2 no matter what season of life you are in. The author does state that you may want to refer to Part 3 as you read through Part 2 and I agree that was helpful but do not skip over Part 1 or Part 2 just to get to Part 3! The Chore System has two parts: The How-To Cards and the Job Labels. I really wish I had used How-To cards when I was teaching the girls different chores. I'm thinking a few of those now would not be a bad idea. She included several pre-printed how-to cards such as Setting the Table or Wash Bathroom Walls. She also included job labels for the most common tasks. Some of the job labels are: Groom Animals, Sort Laundry, and Cut Grass. I love that she included job cards for Help Brother and Help Sister! Vicki Bentley even included Assistant Cook as a job label. What I love best are the blank cards. Because my copy is a PDF Download I can just print however many sheets I need directly onto Card Stock. If you purchase the printed copy she encourages you to photocopy the blank pages onto card stock though you can use them straight from the book. There is a Suggested Resources page after the last page of blank cards but with the new website design I couldn't find the referenced list of resources. Hopefully Everyday Homemaking will put the list back on their website or better yet include it in the next printing or edition of the book. 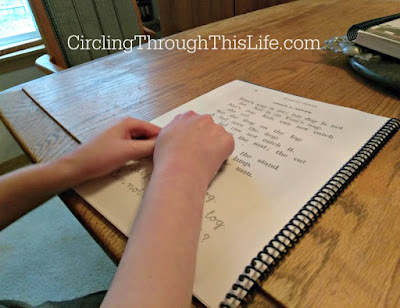 So Boobear, Tailorbear and I brainstormed how to take the ideas from The Everyday Family Chore System and put together something that we could use. Something VISIBLE. Something easy. The original Bentley system used clothespins on a large board. Mrs Bentley describes several ways you can use the Job Labels. We decided we liked the board idea. 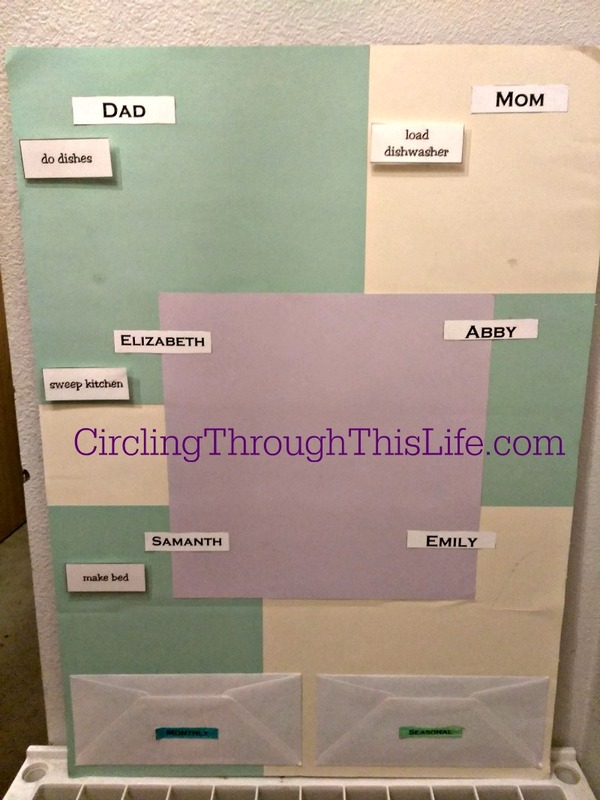 But instead of having the names of family in the center with weekly chores on one side and daily on the other we would color code them. We put names in different sections. We also decided to laminate the job cards and use velco. Our Family Chore System is still in the "working out the kinks" and "testing". It's a work in progress. I'm excited though. It's a step in the right direction. 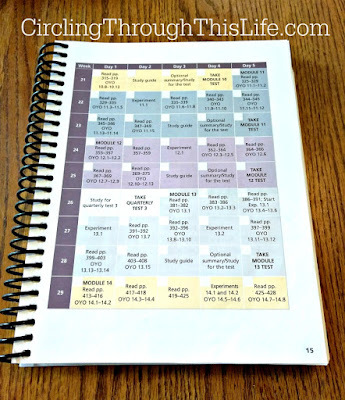 Do you have a chore system that works for you? Do you have a cookbook that will help you teach cooking skills to your children? Go read more reviews! I think you'll want your own copy of Everyday Cooking or the Everyday Family Chore System! Visit Everyday Homemaking on Facebook! Many years ago when my girls were still very young, I was introduced to Apologia Educational Ministries through their Elementary Science Series of books. We used Exploring Creation Through Astronomy and followed it up with Exploring Creation through Botany. As the girls grew we continued to include Apologia Science in our home school and in high school all three of the "big" girls used Exploring Creation Through Biology. 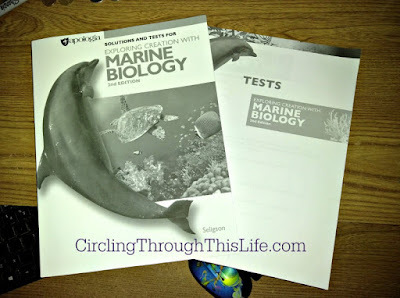 Recently, as part of my role with the Homeschool Review Crew, I received Marine Biology 2nd Edition Advantage Set. 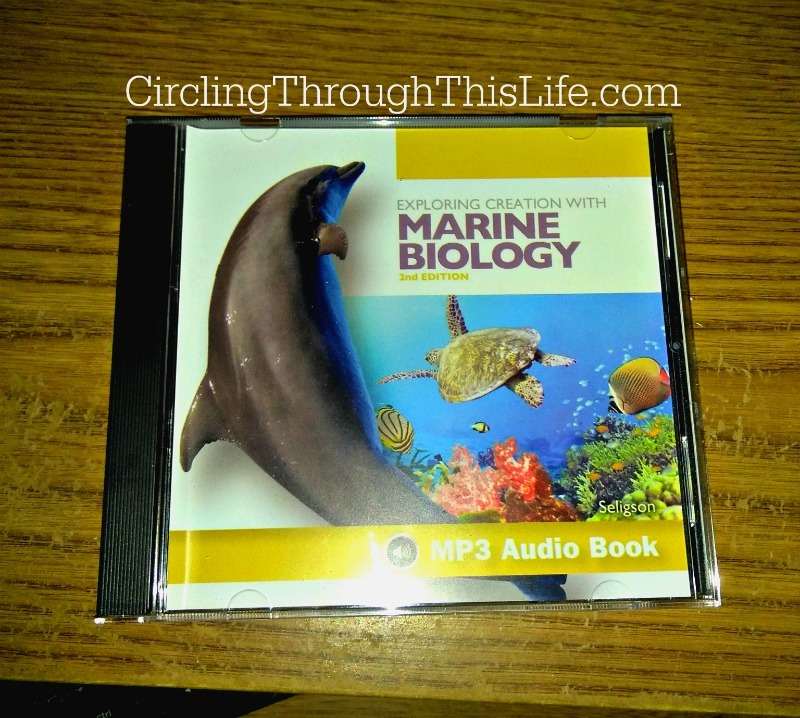 Apologia generously included the Marine Biology 2nd Edition Audio CD. If you're a regular reader of my blog you'll know that I don't have any high school students anymore. Boobear graduated from University in May. In June Tailorbear graduated from our home school high school. Turtlegirl graduated last year and is away at college. All of them said the same thing "oh man, I wanted to study Marine Biology when I was in high school!" Much to our mutual disappointment we had run out of time. Funny how things work out though. Boobear came to me and asked if it would be okay if she read the textbook. She still wanted to learn more about Marine Biology. A few days later she asked me "mom, would it be okay if I wrote in the Student Notebook?" So my college graduate daughter has started studying Marine Biology just for fun! So let me tell you about this Marine Biology Course! The author is Sherri Seligson with technical editorial contributions from Dr. Robert Carter, PhD Marine Biology. The text is written to the student in a conversational tone. It begins with Student Notes that describe the course. Marine Biology is divided into 16 modules. The recommend pace of approximately 2 weeks per module plus tests and has students finishing the course in 34 weeks. When I think of biology I think of studying life forms. I imagine studying respiratory systems and digestion tracts. I think of dissecting frogs or in the case of Marine Biology fish. 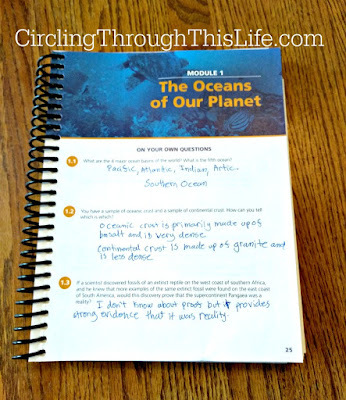 I don't necessarily think of studying the composition of the ocean or the continental drift. I love that this course covers the geology and ecology of the ocean as well as exploring the all the life forms that live there! The Text also contains a Glossary, Index, and several Appendixes. This is a lab course! The laboratory exercises fall into one of three categories: microscope labs, dissection labs, and household labs. Just as the name implies the household labs use only household equipment. You'll need a microscope and prepared slides to complete the microscope activities and for the dissection exercises you'll need a dissection specimens kit and tools. 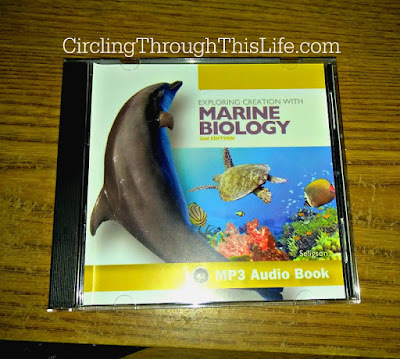 Since Marine Biology is an advanced biology course it is assumed that the student has completed high school biology. It is also assumed that since they already took Biology they would have a microscope and dissection tools. This course can be completed without doing the Labs but most colleges and universities require multiple science courses with a lab so this course would fulfill that requirement. Introduction ~ This section includes a note for parents, rubrics for grading labs and a beautiful schedule that includes all the readings, questions, labs, and tests. 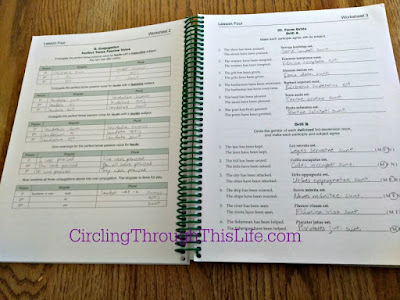 Modules Notes, "On Your Own," Study Guide, and Optional Summary ~ This section has pages for students to take notes and has all the questions from the text but laid out with space for the student to write out their answers. Lab Reports ~ Includes the details such as the procedure as well a place to write out observations, and make drawings and diagrams. 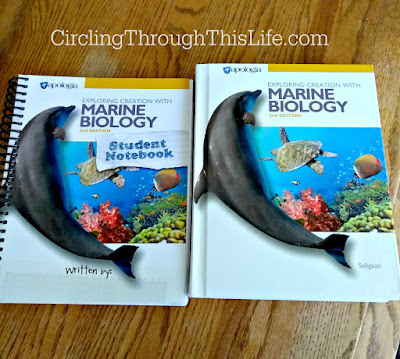 In addition to the textbook and the Student Notebook the Advantage Set also includes the paperback Solutions and Tests for Exploring Creation with Marine Biology 2nd Edition. This came shrink wrapped with a smaller paper pamphlet of just the tests. The larger solution manual is more than just answers to all of the study guide questions, copies of tests, and answers to tests. The front section contains helpful information about the course and how to administer the course including grading information. The Advantage Set contains everything you need to be successful with the course but Apologia also sent us the Audio CD. This is sold separately. It is MP3 Format and must be played with an MP3 compatible cd player or computer. We found that our DVD player which also plays CDs is MP3 CD compatible. The CD is complete audio recording of the book and is read by Marissa Leinart Students who have difficulty reading the text or who might be auditory learners will find this very helpful. Boobear is very visual so prefers to read the text herself. For her it would be too difficult to listen to the audio and try to take notes. For the purposes of this review I listened to a couple sections of Module 1. I noticed that the reading was clear. She was easy to understand. She read at a pace that was fast enough that I wasn't lost but too fast for me to stop and pause. She reads the text including vocabulary definitions and On Your Own questions but she doesn't read figures or captions. I really wanted her to pause so that I could pause the CD to study the Figures. She doesn't read the experiments. Again I wish there was some type of pause built it or a "please stop the CD now and complete the experiment." I really enjoy how this text book is laid out and how the author was clear with the description. I also appreciated that the first module was laying down a very through foundation, while this sometimes was boring I appreciated making sure that the students starting the course knew all the information that needs to be known. My favorite thing though is the student notebook. It would have been so much easier in high school to have had that. I was not sure that the note taking was something that I cared about but for students that are unfamiliar to note taking it is great training. I really appreciated the questions being in the note book and the chapter summaries plus study guide. Maybe I take too many notes but I do wish it had more of the Notes pages. Overall it is so much easier to have a note book that has all of that that you can use with the text book. There you have it! A program so well put together that it inspires the learning to continue even after college! We both recommend Exploring Creation with Marine Biology as an additional science with a lab credit for your biology loving students! While I have always considered myself more of an eclectic style homeschooler I do have some classical leanings such as teaching Latin. There are many benefits to teaching Latin but rather than discuss that I want to tell you about Memoria Press and their Latin programs. Well, specifically I want to chat about the Third Form Latin Complete Set. I have to begin at the beginning though. Many many years ago we started with Memoria Press's Latina Christiana Complete Set which by the way has been completely revised including new DVD lessons. We still laugh at Honeybear's joke about amo. We'd be practicing our recitation amo, amas, amat, amamus, amatis, amant and Honeybear would interject you have a ma moose, but what about the pa moose? 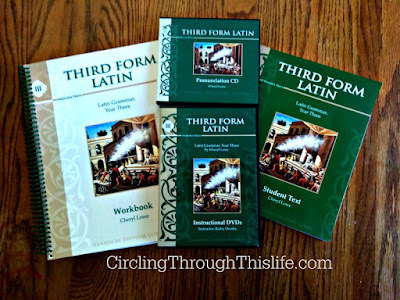 A few years later we had the opportunity to review First Form Latin and we were hooked! We loved First Form so much that I purchased Second Form Latin. Turtlegirl was thrilled to find out that we now own Third Form and Fourth Form! As I have said many times before, mastery is the key to success in Latin. Students enjoy what they have thoroughly learned. They do not enjoy what they have half-learned and half-understood. The seriousness of this advice becomes more obvious with every lesson. Grammar is added to grammar, and vocabulary is added to vocabulary. The work of mastery and review must continue and not let up. In Third Form Latin, Ms. Lowe continues to build upon the grammar and vocabulary she taught in First and Second Form Latin. Since Turtlegirl has been using Third Form Latin I've enlisted her help with writing this review. Let's take look at each of the parts included in the complete set. One of the first things Turtlegirl noticed about the student workbook is that it is spiral-bound now. It was not spiral-bound before when she studied First and Second Form. She loves that they changed the binding because it is much easier to work with now. As for the format, there are 7-9 exercises per lesson. These exercises involve practicing grammar, the lesson's Latin saying, vocabulary, several form drills, and translation exercises. If there are derivatives for that lesson, there will be an exercise using those. The exercises are sometimes broken down into Drill A, Drill B, etc. It should also be noted that the pages in the Student Workbook are numbered with the lesson and "Worksheet #". The Worksheet numbers reset for each lesson. However, the different exercises could start on one workbook page and end on the next. Generally, the lesson starts with grammar, then the Latin saying, then vocabulary, then the form drills, and then translation and derivatives. The course is divided into 5 (V) units. Each unit has a specific focus. Generally, the unit begins with a review of the grammar and vocabulary learned in the previous Forms that relates to the unit's focus. The unit ends with a review of what was covered in the unit. Each lesson in the unit has a Latin saying. For the lessons, the session begins with a recitation of the conjugations and declensions that the student has learned. Afterward, the instructor goes over the vocabulary for that lesson, saying the Latin first, then the English, and then the Latin again. The grammar for that lesson is discussed. The Pronunciation CD also serves as a review of all of the vocabulary, since the instructor goes over the Latin pronunciation and the meaning. If a verb has irregular principle parts, the instructor says all of them. There is also a mini-quiz at the end of each track to help the students' comprehension and memory. There is no quiz for Lesson 1 since Lesson 1 did not have any new vocabulary and instead reviewed what was learned in First and Second Form. Lesson 2 is heavy on review but has some new vocabulary. With Lesson 3 you are off and running with Third Form. The length of the tracks depends on what was covered in the lesson. This means that the track could be as short as two minutes or as long as 12 minutes. 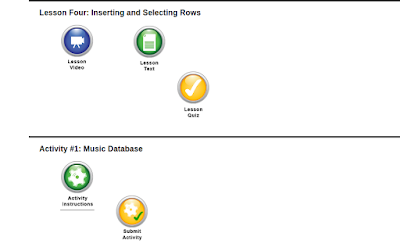 The quizzes have the same look as the workbook pages with fill in the blanks and fill in the charts. Generally all the quizzes will have sections on Vocabulary, Conjugate, Decline, Translate, and Grammar. Quizzes are 2 to 3 pages long. Unit tests are longer ranging from 3 to 5 pages in length. Unit Tests also include sections for Latin Sayings. A Final Exam is also included. These are perfect bound and perforated. We tear them out as needed which makes it easier to write on the pages. If you as a parent are teaching this course the Teacher Manual is invaluable. Even though I rely on the Instructional DVDs to do the teaching, I find the Teacher Manual valuable. In addition to laying out what you should teach (and sometimes how to teach and what to say!) it has several appendices full of reference material. The Teacher Manual includes teaching guidelines, which also include a sample lesson plan. 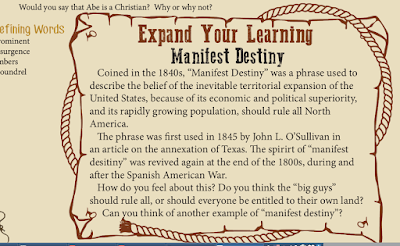 The Student Text pages are embedded in each Lesson. This is a handy feature as it means you can reference the student pages while preparing to teach the lesson without having to hunt down the Student Text. Say each word aloud with its meaning, and have students repeat after you. Begin every day with this oral drill of the week's new vocabulary. These are the hard little words in any language. They require extra attention. (Lesson V page 19 Teacher Manual). There are no answers to student workbook pages in the Teacher Manual so there is no worry that students will just copy the work. 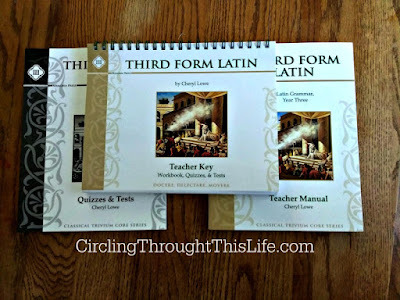 While I am not using Third Form Latin for high school credit, if I were, I would gladly hand my independent student the Teacher Manual to aid them in their studies. My one complaint though about the Teacher Manual is that it is perfect bound. I wish it was spiral bound. But what about the answers to the workbook pages, quizzes and exams? There is the Teacher Key! The Teacher Key is spiral bound. It is simply the student workbook pages, quizzes and tests with the answers filled in. When we were using First Form and Second Form for high school credit these were my lifeline to grading. I did not have to know any Latin at all. Even Honeybear did some grading and he had less Latin exposure than I did! 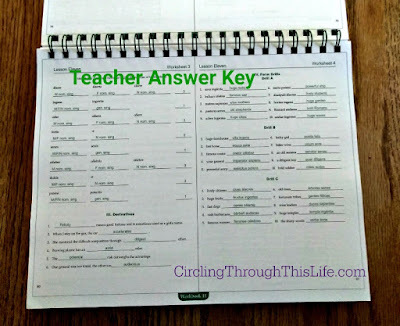 To save space each two page spread of the Teacher Key has 4 student pages. This does make them a little harder to read but it also makes it so that key is not so huge and unwieldy. I love Latin. That's no secret. So, of course, I was super happy to work with Third Form since I'd already worked with First and Second Form. I found myself a little rusty, so the review in the first few lessons was very helpful. I love the spiral binding on the workbook. It made my life much easier. I also found the instructional videos very easy to follow. It was nostalgic for me to recite the conjugations again. I recommend Third Form Latin as well as the other forms because it's easy for self-study as well as a formal study environment. I love that the Form series is so complete and thorough. 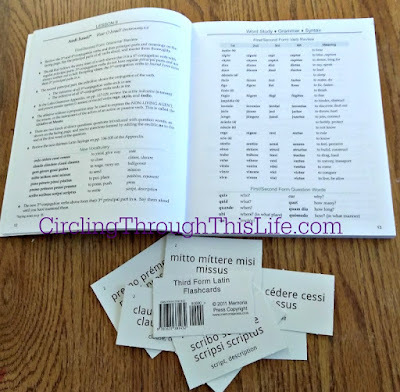 I think learning Latin is more fun when learning in a group but with the instructional DVDs this program works very well for driven independent learners. When folks ask me what do I recommend for Latin? I answer Memoria Press. Supergirl is loving Prima Latina. Boobear is refreshing her memory of Latin and I'm learning right along with Supergirl. If you are just starting high school and just starting Latin, I encourage you try First Form Latin. You may find yourself like us wanting to continue with Second Form, then Third Form and yes I know we'll be doing Fourth Form as well and my girls are college age and beyond now! Check out Memoria Press on Social Media! In this day and age the ability to use a computer is nearly essential for so many of our daily activities. Our students need to be familiar with computers and many students enjoy programing and coding. Recently the Homeschool Review Crew had the opportunity to use and review their choice of one of three online courses from CompuScholar, Inc. As a crew leader I was blessed to receive teacher and student access for all three courses: Digital Savvy, Web Design, and Java Programming. You may already be familiar with CompuScholar, Inc. from their old name: Homeschool Programming. We loved Homeschool Programming and I even wrote a review of their TeenCoder C# Series which included Windows Programming and Games Programming. While I have learned my way around computers, there is still so much I don't really know or understand so I've been working through Digital Savvy for myself! Digital Savvy is a great introduction to computers and technology. It starts with the basics. In the lessons in the first chapter explain what "hardware" is. You'll also learn a bit of the history of computers and you'll be able to define "peripherals". In the following chapters you'll learn about software, operating systems, and computer files. One thing I really appreciated about Digital Savvy is that it included information on Linux and Android not just Mac and Windows! In addition to these computer basics, you'll learn about Search Engines, Computer Networks, and Computer Security. What I am looking forward to though are the chapters that cover Word Processing, Spreadsheet Programs, Presentation Programs, and Database Technology. I am hoping that the chapter on Database Technology will give me enough skills to start playing with creating a database to use for church library! (Yes, Honeybear and I have volunteered to do the Church Library!) There is even a chapter that covers Project Management and Teamwork. Oh goodness but listening to BooBear as she worked with many teams to do project presentations in her different classes she and her classmates would have done well to study this chapter! In the second half of the course students move into working with the internet. There are two chapters just on Social Media. I think I might have to skip ahead to the chapter on Digital Images. Also covered are Web Design and Internet Communication. Digital Savvy also introduces Programming Concepts and Digital Logic. The last chapter before the Final Project covers Careers and Professional Skills. These courses are online and students work can work through the materials independently. Students and teachers log in to their account and are taken to their dashboard or home page. To get to the course material click on the course title. This will bring up the page with the list of chapters. Click on a chapter to see the individual lessons, chapter activity, and exam. Unfortunately the program does not remember where you left off. Digital Savvy has 25 chapters plus a "chapter" of Supplemental Lessons. Each chapter is divided into Lessons. The number of lessons varies from chapter to chapter with as few as 3 Lessons to as many as 6. Most chapters have 3 Lessons. All Chapters include an Activity and a Chapter Exam. Each lesson contains Video, Text and Quiz. The same information from the Video is presented in the Text however, there is more information in the Text. Ideally, the student would watch the video which gives an introduction to the lesson and then read through through the Lesson Text. If a student is only going to complete one or the other, I strongly recommend choosing Lesson Text over Lesson Video as the text includes additional information and for many of the lessons a Work With Me Section that includes discussion questions or an assignment. The Chapter Activity provides hands on experience with the skills or topics covered. For example in the activity for Chapter 4 students create folders, copy, move, and delete folders, and create a zip file. When I get to Chapter 12, I will create a Music Database and I hope that will give me the experience I need to create a Book Database! Lesson Quizzes and Chapter Exams are graded automatically by the program. In Digital Savvy and Web Design students may attempt the quiz up to 3 times. We noticed though that in Java Programming it was only 2 attempts. Chapter Activities must be graded by the teacher. These can be submitted through the course and the teacher can access them through their Dashboard. The grading is easy! CompuScholar includes a Rubric so I just have to answer "yes" or "no". The course calculates the grade for me. First of all, I am a Computer Science major. I know my way around computers. I was doing this for fun. I decided to play around with the Web Design and Java Programming because it's been awhile since I studied Websites and I have never learned Java. 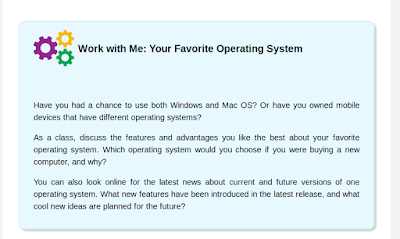 One of the things I noticed and appreciated was the inclusion of Linux and other operating systems besides Windows in the first chapters of the Java Programming. I also greatly appreciated the time they took to introduce the history of computers and operating systems, as well as the discussion of computer ethics. I like having both a video to watch and a lesson to read. I did find that I could skip the video and not miss any information. I like the submission format, and I like that the program gives the student the grading rubric. I find that very helpful. 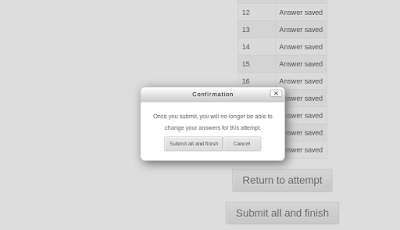 I did not like the fact that with the quizzes, the wrong answers are not clearly shown in the review section. I found it very difficult to find where I went wrong and it was very frustrating. Overall, I liked the program a lot and I recommend it to students and those who are just studying computer science for fun. 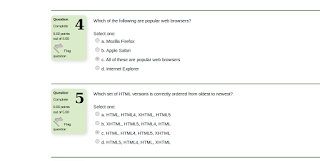 I agree with Turtlegirl that for Web Design and Java Programming, which are set up exactly like Digital Savvy with Chapters that include Lessons, Activity and Chapter Exam including Lesson Video, Lesson Text, and Lesson Quiz, do not have the same easily visible "this answer is right" or "this answer is "wrong". I really appreciate that Digital Savvy shows the correct answer. I love how easy it is to use the courses. These are solid programs and the Java Programming is an AP level course! I recommend Digital Savvy for all students as an introductory computer science course and for students who discover a love of computers and programming I would suggest moving on to Web Design, Java Programming or any of the other courses offered. The courses offered by CompuScholar, Inc. prepared Turtlegirl so well that she was bit bored in her computer science class at college! Don't just take our word for it! Go check out what other crew members had to save about these courses! 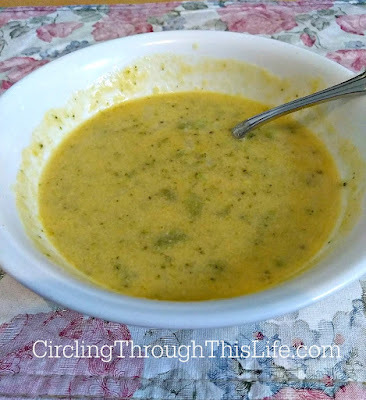 Menu Monday: Using up Left Overs: Broccoli Cheddar Soup! I don't have any idea how regularly I will do a Menu Monday post but I like the idea of sharing a menu, recipe, or meal idea on a Monday. Today I want to share a lunch idea using up leftovers. Not so much a recipe, but sharing what I did to use up left over broccoli. If you were to ask my family if they like broccoli I am fairly certain they would look at you like you had two heads. Like broccoli? I don't think so. They might say "well I'll eat it," or they might respond with "I prefer it raw." I've discovered though that Supergirl loves broccoli with cheese. Since I'm trying to get her to eat more veggies and we we are trying to get her to eat more protein we eat broccoli a few times a week. Steamed. For Supergirl I might sprinkle some Parmesan or shredded Cheddar on it. Sometimes I splurge and buy those "microwave-in-a-bag" broccoli with cheese sauce. Don't let them fool you though. They like broccoli. They just seem to think that they must hide it. Maybe they are afraid if they admit it the world will explode. People are not supposed to like broccoli right? There is one way though that my family seems to LOVE broccoli. In soup. Cream of Broccoli Cheddar Soup. I almost forgot to take a picture! So you get a messy half full bowl. It was that good! Sometimes the bag of frozen broccoli (okay okay most times!) is too much because there are only 4 of us eating instead of 5 or 6. I end up with leftovers. Not quite enough to serve as a side dish for another meal but too much to throw away. So the other day I made it into a soup. I took the left over broccoli chopped it up a bit more and threw it in a pan and barely covered it with some chicken broth. It was already tender from being steamed the night before so I wanted to be careful that I did not over cook it but I did want those steams to be even more tender. Brought the broth to boil and then turned the heat down. I stirred in some cheese and some half and half. Decided it was a little too thin so mixed some cornstarch with water (not too much) and stirred that into it. Creamy, cheesy, broccoli soup. It fast. It was easy. It used up leftovers. I have been told that I need cook broccoli this week. A big bag. You know so we can have some left overs to make soup. 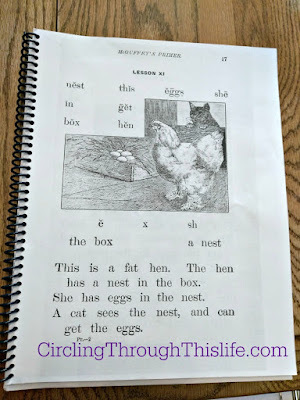 I have been teaching reading in one way shape or form in my home school for nearly 18 years. I have tried so many different reading programs with each of my daughters that I have lost count. Most of those learn to read programs I used with Supergirl. I've learned that I really prefer a phonics based approach. I've learned reading is complex skill that is as much about a child's developmental readiness as it is on the program you use and, that no matter what program you use, fluency seems to come best when real sentences and stories are used. The one approach I hadn't tried yet was the old fashioned curriculum idea. How about using McGuffey's Eclectic Readers to teach reading? 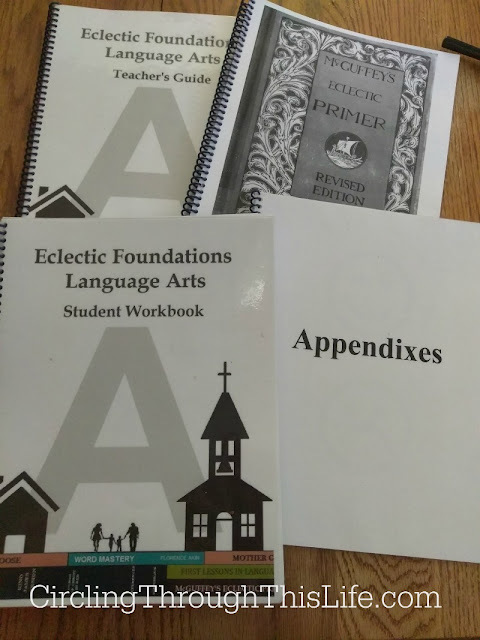 I was excited to see that Eclectic Foundations would be offering their Language Arts Levels A, B, and C to the Homeschool Review Crew. Let me start by telling you how I settled on using Eclectic Foundations Language Arts Level A with Supergirl. Because I am a crew leader, I received all three currently available levels. I wasn't sure exactly which level, A or B would be the best fit for Supergirl. Looking at Level A, I was concerned that it would be too easy for her as the focus is learning the alphabet. The McGruffey's Eclectic Primer is not used until nearly the middle of the program. Supergirl already knows the phonemes of the basic 26 phonograms as well as a few more phonograms such as ai, ch, and ck. Level A at first blush looked like it would bore her. According to the Which Level Should I start With page, a child who knows how to read basic CVC words should be fine to start with Level B but when I looked through my copy of Level B, I wasn't comfortable starting her there because the first lesson includes a word list with the silent e pattern. This is covered towards the end of Level A. Also I didn't believe she was reading fluently enough to feel confident with Level B. The First Reader starts out simply enough with CVC words but does move quickly into longer more difficult words. I was worried that I would not be able to use either level with her so I sat down and paged through the Teacher Guide of Level A. There is definitely material in the second half of the program that she has not been introduced to. She has not learned the "silent e" rule and this is part of the scope and sequence of Level A.
I highly encourage you to read the company's perspective on Why Eclectic Foundations. In addition to using the Revised Editions of McGuffey's Eclectic Readers, Elizabeth Ratliff based the phonics portion of the program on Word Mastery. She also includes daily Mother Goose rhymes from a 1916 version of the Real Mother Goose. Eclectic Foundations Language Arts is designed to be used 4 days a week for 36 weeks. There are 144 lessons. The first 26 weeks or 104 lessons teach the alphabet 1 letter per week. They are not taught in alphabetical order but instead in an order to facilitate reading real words as quickly as possible. Blending of two and three letters begins in week 2 and in week 3 reading practice includes reading two CVC words. McGuffy's Eclectic Reader ~ Students begin to read the McGuffey's Eclectic Primer starting in Lesson 65. Students will study the picture, read the selection, and color the word cards. The selections typically have a few words for practicing and then a few sentences. Every 5th lesson in the McGuffey's reader is a review passage. These are longer and incorporate the words the student has been reading in previous lessons. Ms. Ratliff suggests reading the selection at least 3 times. 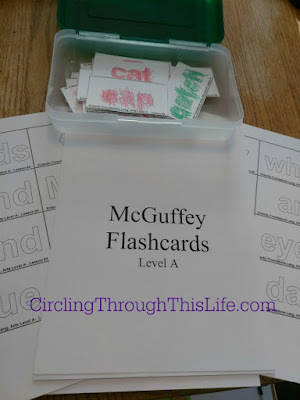 Students can and should use the flashcards for more practice. Phonics ~ For most of Level A the phonics lessons are basically learning the letters, one letter at a time, but this shifts with lesson 105. Beginning with lesson 105 students will have a list of words to practice reading. These words are not related to the McGuffey reading section. There are a variety of activities in Lessons 1-104 to teach phonemic awareness, tracking, and the sounds of the 26 letters of the alphabet. There is no instruction other than to help your student read the words for the lessons for lessons 105- 144. 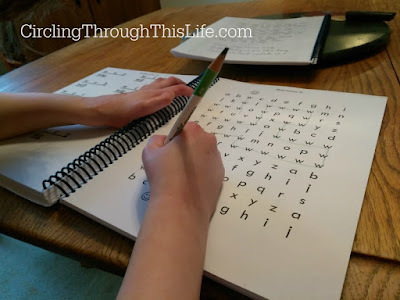 Handwriting ~ For the lessons through 104 handwriting focuses on learning how to print the letters. A variety of activities are offered each week from building the letter with playdough to writing it in sand to actually practice writing the letter in the student workbook handwriting page. Lesson 105 the handwriting becomes copywork as students practice writing by copying a sentence from the day's McGuffey Reader selection. Mother Goose ~ For Level A simply read the daily rhyme to your child and enjoy it together. Ms. Ratliff suggests that if your child is artistically inclined she may want to draw a picture to go with the Mother Goose reading. Grammar ~ While not stated in the Overview there is a fifth component woven though out the program: Grammar. Grammar lessons are gentle introductions of topics that will be studied more in-depth in later years. The flashcards are used, not just for reading practice, but also for a gentle introduction to the parts of speech. As part of the McGuffey Reader part of the lesson, the student will cut out and color the words from the reader. These words are color coded according to their parts of speech. Red for nouns, Green for verbs, etc. From lessons 65-104 periodic grammar lessons introducing the parts of speech appear during McGuffey Reader review weeks. Starting with lesson 105, grammar is covered daily. These are simple lessons such as learning about capital letters and starting a sentence with a capital or learning about proper and common nouns and other lessons introduce punctuation. As I stated above we started with Lesson 65. We do not do all of the activities such as forming the letter with playdough. Some lessons take us longer than others depending on whether I introduce a new phonogram from the Reader or we choose to use Can Do Letter blocks to build words instead of the laminated appendix. We follow the suggestion to read the passage 3 times. I thought Supergirl would balk at reading the same passage 3 times but she doesn't mind and I truly see her reading and confidence build. We do use the word cards if there are any words that she really struggles with. We also use letter tiles and letter cubes to build any words she struggles with. We do the student workbook pages as assigned for the lesson because Supergirl enjoys them and I think they help her solidify skills such as tracking and discrimination. Two of my favorite worksheets are the letter matching and the maze. With the letter matching students are instructed to match the mama letters (Uppercase) with the baby letters (lowercase). These letters are written in different styles and fonts. The maze has the student trace the path created by the letter of the week. This teaches tracking and discrimination. Most Lessons include a game. There are two variations of a "listening game" that develops phonemic awareness, a foundational reading skill. In the first one, Starting ? Game, you listen for the target to sound to identify if the word starts with that sound. In Begin, Middle, End? you listen for the target sound and identify whether it is in the beginning, middle, or end of a word. The target sound corresponds to the letter of the week. Supergirl and I both love the Word Building Game. 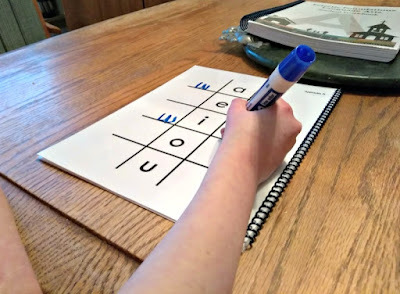 This teaches another foundational phonemic awareness skill: segmenting. She calls it spelling because when we break the word down into it's segments we are identifying the phoneme and writing down the correct phonogram. I wish that this program included phonogram cards or a cheat sheet of what sounds the letters make. I think it would really help if there was something in the Introduction of the Teacher Guide that addressed the concept of "sight words" or rather words that do follow more advanced patterns but are introduced now to make the stories more interesting to read. I would love a heads up in the teacher guide about which "sight words" are introduced that day in the McGuffey reader. I find it jarring to have Supergirl practice reading CVC words in the phonics but reading CVCC and longer words in the Reader. Something in the Introduction or some notes in the Teacher Guide for each lessons would be great. Something like "today your student will read stand. You may want to introduce this flashcard and practice blending before reading today's McGuffey selection." I like it because I love to read. I like the word building game because it is like spelling. I like the reader and I like reading to my mom. It is fun. I am learning to read and write words like frog, cat, Rab, dog, stand, catch, and sit. I love this program for Supergirl right now. I love how short the lessons are but most of all I love seeing my daughter's fluency improve and her confidence grow. I like how simple it is. I do want to point out that this would not have been a good fit for Supergirl a year ago and this would not have been a good fit for BooBear when she was first learning to read at age 4/5. However, this would have been near perfect to use with Turtlegirl and Tailorbear who understood phonices much more instinctively and both were ready to read at age 4/5. When we finish Level A we will move into Level B and if that goes as well as Level A, we'll continue with Level C.
Some crew members reviewed Level A, others Level B and a few reviewed Level C. Please visit the Homeschool Review Crew blog to read their reviews! Visit Eclectic Foundations on Facebook!